Official synopsis: "A brand new series from the Author of TIMERIDERS! Welcome to a universe as you've never seen it before;- genetically engineered pocket pets, plant life with a crabby attitude, soda pops that fight back...and revoltingly slimy junk food. Ellie Quin's just a normal young woman. Bored with her life on a remote farm, staring up at the stars at night and wishing she was far away on another more exciting world. She thought she was normal. Turns out she was wrong. It turns out she's the most valuable, the most dangerous, the most hunted-for human in the universe... and there are people already closing in on her. 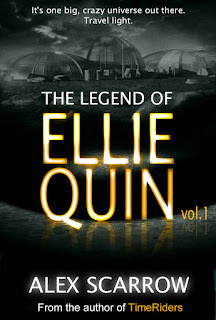 The Legend of Ellie Quin: a breathless pursuit across a colourful, madcap universe of shopping malls and space ships. Lip-gloss and lazer guns." I am a big fan of Alex Scarrow, and I am damn proud of it. I love love LOVE his TimeRiders series - the tale of three teens on the cusp of death, pulled out of real life to police time and stop those that can also travel through the decades, centuries, millennia and further from causing world wide devastation - so when I heard that he was publishing a new book, exclusively electronic and that it was part of a trilogy I was quite excited. And I was right to be. We don't see that much of the city, New Haven, in book one, but I feel like we've already got a good glimpse, and it's safe to say that it doesn't live up to poor Ellie's expectations. I can't wait to see more of it in the second book, The World According to Ellie Quin. I loved this book so much. It took me a little while to read it due to it being over the Christmas period and family stuff taking up a lot of my time, but I liked that it was a slow read. It has this feel to it, a real Sci-Fi feeling, and just in general that you want to savour every last word. It's fun, exciting and very engaging. I didn't want to put my Kindle down for anything. With the TimeRiders books, they're more focused on the past, stuff that has already happened and asking questions about what difference even a minute change would have on the present day. 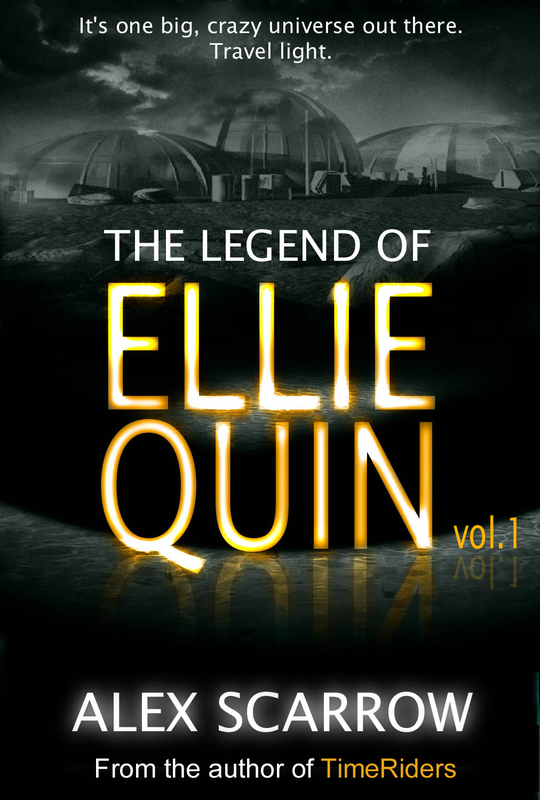 Whilst we do get little glimpses of futuristic elements, it's nothing on the scale of which we see in Ellie Quin. The fun Alex must have had inventing and thinking up some of the things we find in the book is evident! I mean, they're harvesting oxygen! Cool. I think that's what made this book so much fun to read, made it so enjoyable - you can tell that Alex has loved writing this, it shows. This book however is a big tease! There are a lot of questions left open to take us in to book two, and I for one cannot wait to get stuck in! Ryan, I just wanted to say a quick thankyou for posting such a lovely review of ELLIE QUIN. Really glad you've enjoyed the series thus far, and hope you'll stick with ELLIE throughout the rest of the series. Hey Ryan, just wanted to stop by and tell you that Alex Scarrow is up for Q and A's with bloggers all around the world.